CBI - China: Day 143 of 154 of the Japanese Invasion of Manchuria. CBI - China: Day 11 of 41 of the 1st Battle of Shanghai. CBI - China: Day 38 of 142 of the 1st Battle of Hebei. Spain: Day 206 of 985 of the Spanish Civil War. Spain: Day 571 of 985 of the Spanish Civil War. CBI - China: Day 216 of 2,987 of the 2nd Sino-Japanese War. Day 1 of 124 of the Battle of Henan. Spain: Day 936 of 985 of the Spanish Civil War. CBI - China: Day 581 of 2,987 of the 2nd Sino-Japanese War. Finland: Day 70 of 105 of the Russo-Finnish War. CBI - China: Day 946 of 2,987 of the 2nd Sino-Japanese War. Day 85 of 381 of the Battle of South Guangxi. Day 11 of 67 of the Battle of Wuyuan. ETO - UK: Day 155 of 258 of the Blitz. MTO - North Africa: Day 61 of 63 of the UK's Operation COMPASS, their campaign in North Africa against the Italians in Egypt and Libya. The Italian 10th Army surrenders to the British troops. East Africa: Day 243 of 537 of Italy's East African campaign in the lands south of Egypt. East Africa - Eritrea: Day 3 of 56 of the Battle of Keren. CBI - China: Day 1,312 of 2,987 of the 2nd Sino-Japanese War. Day 9 of 31 of the Battle of South Henan. CBI - Thailand: Day 130 of 221 of the Franco-Thai War (Vichy France vs Thailand). Atlantic: Day 25 of 169 of Germany's Second "Happy Time," during which U-boats sink 609 Allied ships with little risk. Russian Front - North: Day 153 of 872 of the Siege of Leningrad. Russian Front - North: Day 16 of 103 of the Battle of the Kholm Pocket. Another attempt to break the siege at Leningrad. Russian Front - Center: Day 31 of 103 of the Battle of Vyazma, Russia. Russian Front - Center: Day 31 of 103 of the Battle of Sychevsk, Russia. Russian Front - South: Day 101 of 248 of the Siege of Sevastopol, Crimean Peninsula. All German attacks against Sevastopol are stopped for the winter. MTO - Libya: After two weeks of frenetic action, Rommel's counter-offensive comes to a halt in front of the Gazala line as his Afrika Korps runs low on fuel and reserves. CBI - Burma: Day 56 of 164 of Japan's Invasion of Burma. CBI - China: Day 1,677 of 2,987 of the 2nd Sino-Japanese War. Day 46 of 99 of the 3rd Battle of Changsha. CBI - Java: Day 9 of 17 of the Battle of Singapore. UK commander Lt General Percival declares that the city will be held to the last man. The Japanese launch a feint landing on Pulua Ubin Island to the east. PTO - Borneo: Day 54 of 107 of the Battle of Borneo. PTO - New Guinea: Day 16 of 18 of the Battle of Rabaul, New Britain Island. PTO - Philippines: Day 62 of 152 of the 1st Battle of the Philippines. 5th Air Force provides air support. USA: To conserve leather and rubber, shoe rationing begins in the US, limiting civilians to three pairs of leather shoes per year. Shoe styles made of fabric and jute with wooden wedge heels become very popular with women. Espadrilles, a style of shoe with an upper made of fabric and a sole made of jute, became very popular because they were not subject to rationing. Wedge heels, made of wood, were also popular. 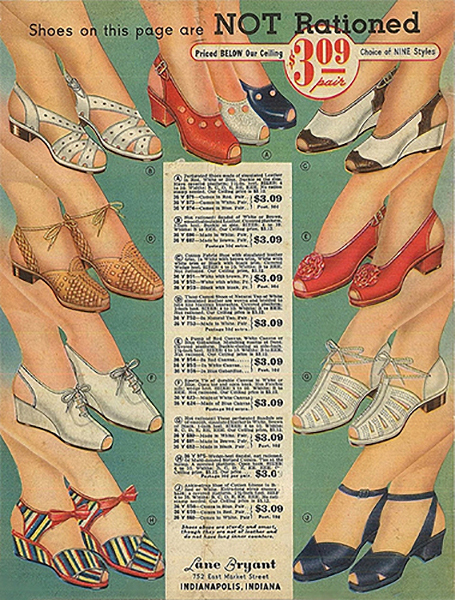 Shoes in "victory colors" such as the ones available in red, white and blue at the top center of this ad, made a statement that was both stylish and patriotic. With silk and nylon virtually unavailable for women's stockings, products such as this faux seam application tool found a market during the war years. Back then, stockings were made with seams in the back, which women were constantly adjusting to keep their seams straight. ETO - UK: Capt Robert Shannon's crew flies their 25th bombing mission in a B-24 Liberator named HOT STUFF, becoming the first crew in the ETO to complete a tour of duty. 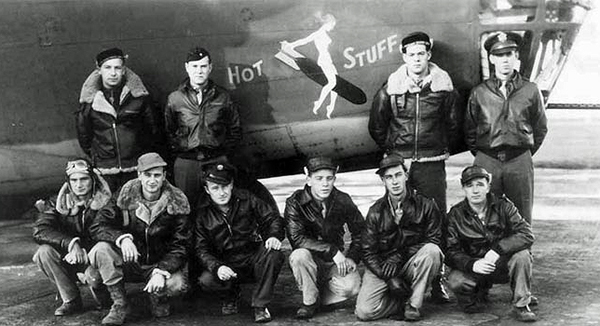 The first heavy bomber to complete 25 missions was not a B-17 Flying Fortress, but a B-24 Liberator named HOT STUFF. Second was the B-17 HELL'S ANGELS, followed by the B-17 MEMPHIS BELLE. Between a crewman missing a mission by being wounded or sick or gaining another mission by substituting on another crew on other missions, rarely did a crew complete a tour of duty together. Early in the war, most bomb groups had no assigned, designated crews, but would draw crewmen for each mission from a pool of available men, though they would try and keep men together when possible. There was no magic number of 25 missions that would complete a tour of duty for a member of a bomber crew. Each Air Force's commanders in the field determined when their crewmen had had enough, which started at 25 but rose to 30, 35 and even as high as 50 as the dangers lessened. Some even had a complex point system to make the determination. Even when a crewman reached the required number of missions, he had to remain on base one month after his replacement arrived, during which time if a "maximum effort" mission was called, he could easily find himself flying another mission or more. Russian Front - North: Day 518 of 872 of the Siege of Leningrad. Russian Front - North: Day 279 of 658 of the Siege of the Kholm Pocket, USSR lays siege to the Kholm Pocket but the Germans hold out for a about a year and a half. Russian Front - South: Day 58 of 69 of the USSR's Operation LITTLE SATURN. A successful drive into the Northern Caucasus and the Donets Basin pushing the Axis troops out. MTO - Italy: US 9th Air Force B-24s bomb the harbor at Naples, scoring a direct hit on 1 vessel and hits on others. MTO - Sardinia: US 12th Air Force B-17s and B-26s bomb Elmas Airfield and the seaplane base at Cagliari. MTO - Tunisia: Day 83 of 178 of the Battle of Tunisia. RAF and US Air Forces provide Allied air support. CBI - Burma: Day 49 of 104 of the 1st Battle of Arakan. US 10th Air Force provides air support. CBI - China: Day 2,042 of 2,987 of the 2nd Sino-Japanese War. PTO - Alaska: Day 246 of 435 of the Battle of Kiska, Aleutian Islands. PTO - Malaya: Day 354 of 357 of the Battle of Timor Island, a long guerrilla war ending in Japanese victory. Allies continue evacuating off the island. PTO - Solomon Islands: Day 185 of 187 of the Battle of Guadalcanal. US 13th Air Force provides air support. During the night covered by a rain squall, the last Tokyo Express sneaks into Guadalcanal and evacuates 11,706 soldiers. Atlantic: The first operational "Schnorkel" U-boat arrives in the Atlantic. Russian Front - North: Day 644 of 658 of the Siege of the Kholm Pocket. USSR lays siege to the Kholm Pocket but the Germans hold out for a about a year and a half. Russian Front - North: Day 25 of 48 of the Battle toward the Narva River, Estonia. This drive helped lift the Leningrad siege and goes on to liberate Narva. Russian Front - North: Day 6 of 191 of the Battle of the Narva Isthmus, Estonia. Russian Front - North: Day 25 of 33 of the Battle of Luga, Russia. Taking this town west of Leningrad will open the door toward Estonia. Russian Front - South: Day 46 of 113 of the USSR's Dnieper-Carpathian Offensive in southwestern Ukraine. Russian Front - South: Day 9 of 31 of the Battle of Nikopol, Ukraine. Russian Front - South: Day 15 of 25 of the Battle of the Korsun Bulge in Ukraine. Russian Front - South: Day 12 of 16 of the Battles of Rovno and Lutsk, Ukraine. This Soviet victory will increase the gap in the German line from 70 to 110 miles wide. MTO - Italy: Day 22 of 123 of the Battle of Monte Cassino. RAF and US Air Forces provides air support for the Allied ground troops. MTO - Italy: Day 17 of 136 of the Battle of Anzio. Germans begin a full-scale counter-attack against the Anzio Beachhead. RAF and US Air Forces provides air support for the Allied ground troops. CBI - Burma: Day 40 of 99 of the 2nd Battle of Arakan. Japanese troops capture a divisional Anglo-Indian dressing station at Sinzweya and kill 35 medical staff and patients. CBI - Burma: Day 3 of 19 of the Battle of the Admin Box. US 10th Air Force provides air support. CBI - China: Day 2,407 of 2,987 of the 2nd Sino-Japanese War. PTO - Marshall Islands: Day 8 of 8 of the Battle of Kwajalein. US troops take Kwajalein Island, losing 486 killed and 1,495 wounded, but inflicting 8,386 casualties on the Japanese. PTO - New Guinea: Day 142 of 219 of the Battle of Shaggy Ridge. 5th Air Force provides air support. PTO - New Guinea: Day 139 of 162 of the Battle of the Huon Peninsula. 5th Air Force provides air support. PTO - New Guinea: Day 55 of 597 of the Battle of New Britain. US 13th Air Force provides air support. PTO - Solomon Islands: Day 99 of 295 of the Battle of the Bougainville Islands. US 13th Air Force provides air support. Germany: Anti-fascist Lutheran Pastor Dietrich Bonhoeffer is moved to the Buchenwald concentration camp. ETO - France: Day 191 of 284 of the Battle of Brittany. ETO - France: Day 146 of 236 of the Siege of Dunkirk. ETO - Germany: Day 142 of 145 of the Battle of Hürtgen Forest. ETO: Day 19 of 66 of the Battle to the Rhine. The Germans blow up the floodgates in the Ruhr, flooding the area west of Cologne and preventing the use of floating assault bridges by Allies. The German troops near Alsace, France put up a strong fight in the Colmer Pocket. US 9th Air Force provides air support. Russian Front - Finland: Day 146 of 223 of the Lapland War. Finland and Russia have joined forces to kick the Germans out of Finland's most northern province. Russian Front - Center: Day 116 of 206 of the Battle of the Courland Pocket in Latvia. Russian Front - Center: Day 14 of 75 of the Battle of Königsberg, East Prussia (now Kaliningrad, Russia). Soviet attacks are blocked with the help of German naval gunfire. Russian Front - Center: Day 12 of 17 of the Battle of Rastenburg, East Prussia. The Soviets capture Landsberg, 80 miles northeast of Berlin. Russian Front - Center: Day 13 of 63 of the Battle of the Heiligenbeil Pocket in East Prussia. Russian Front - Center: Day 7 of 31 of the Battle of Schwedt, Germany. Russian Front - South: Day 102 of 108 of the Battle of Budapest, Hungary. Soviet troops have Budapest under siege. MTO: US 15th Air Force B-17s and B-24s bomb targets in Austria, Yugoslavia, Czechoslovakia and Italy. CBI: US 14th Air Force attacks targets throughout China, Burma and French Indochina. CBI: US 20th Air Force bombs targets in French Indochina, Thailand, and Burma. CBI - Burma: Day 20 of 61 of the Battles of Meiktila and Mandalay. The US 10th Air Force provides air support. CBI - Burma: Day 18 of 39 of the Battle of Ramree Island. The US 10th Air Force provides air support. CBI - Burma: Day 4 of 99 of the Battle of Pakokku and Irrawaddy River operations in central Burma. The US 10th Air Force provides air support. CBI - China: Day 2,773 of 2,987 of the 2nd Sino-Japanese War. PTO - Formosa: US 5th Air Force bombs the Heito Airfield while B-25s sink one submarine and a large motor launch plus set a tanker on fire. PTO - Japan: US 7th Air Force bombs targets on Iwo Jima. PTO - New Guinea: Day 408 of 597 of the Battle of New Britain. PTO - New Guinea: Day 292 of 481 of the Battle of Western New Guinea. PTO - Philippines: Day 111 of 299 of the 2nd Battle of the Philippines, aka the Liberation of the Philippines or the Philippines Campaign. PTO - Philippines: Day 55 of 244 of the Battle of Luzon. 5th Air Force provides air support. PTO - Philippines: Day 8 of 22 of the Battle of the Bataan Peninsula. 5th Air Force provides air support. PTO - Philippines: Day 5 of 29 of the Battle of Manila.